Fall is in the air. Although we are still enjoying mostly sunny days and temps in the 70s, many trees have been showing touches of color for weeks, and nightfall arrives noticeably earlier. We could use a good, steady rainfall to give some relief to our thirsty grass and plants, but letting go of summer is always bittersweet. Farewell, summer! It's been (mostly) great. 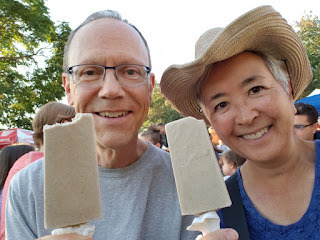 We had what might be our last al fresco dinner of the year at Queen Anne Farmers Market. A barefooted bluegrass band was playing toe-tapping music, but from where I sat, it was hard to see them. 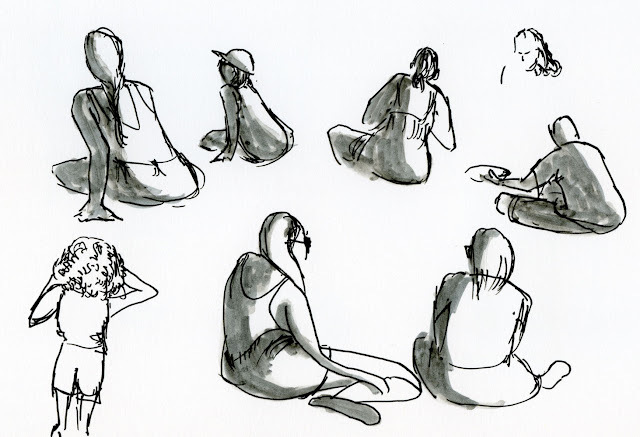 I decided to sketch some of the picnickers sitting in the grass. It reminded me that it’s been a long time since I went to life drawing practice, which I only do when outdoor-sketching weather is over. But that’ll come soon enough. Paper note: My paper comparison post is coming up very soon, and I’ve got a lot to grumble about. This sketch was made on Strathmore Bristol smooth, which is beautiful with graphite, but when I tried to wash the water-soluble brush pen ink with a bit of water, it hardly moved at all. I had to go back in with Pitt marker for shading. Ack. You captured the poses of the seated viewers well. They look like they are really listening. Thank you, Joan! I was focused on trying to show the direction of their weight. Usually crowds of people are standing, so it was an interesting challenge.